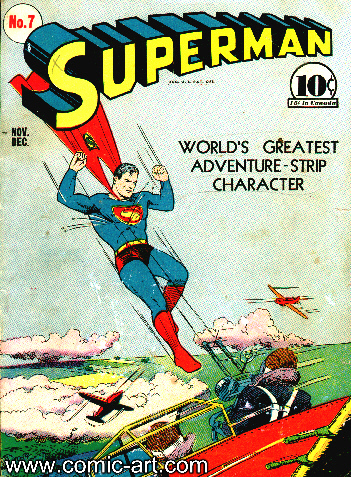 Cover dated Nov-Dec 1940, this is the third Superman cover attributed to Wayne Boring inks over Joe Shuster pencils . Wayne Boring was born on June 5, 1905, in Minnesota. He studied art at the Chicago Art institute and Minnesota School of Art, becoming a comic artist for National Publications in 1937 where he ghosted "Slam Bradley", "Spy" and "Dr.Occult" for Joe Shuster and Jerry Siegel. 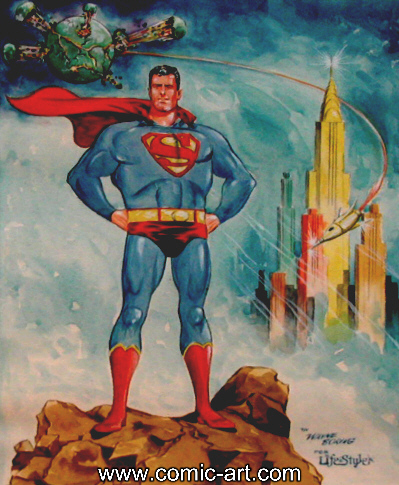 After the success of "Superman" in 1938 Joe Shuster opened his own studio and pulled a few artists from DC to help illustrate the Superman stories that the studio supplied to DC under contract alongside other artists including Ed Dobrotka, Stan Kaye and Paul Cassidy & Leo Nowack as well as others. Over the course of the next 30 years Boring did little else than Superman and became one of the most recognizable artists to draw the character. During the early years at the Shuster Studio, Wayne was emulating the "Shuster Style" as were all the artists there. But by 1942 he had developed a clear style heavily influenced by Flash Gordon artist & creator Alex Raymond. Wayne's work on Superman stories over the next 30 years was a longer relationship than any other artist would have with any other character in the history of comic books. 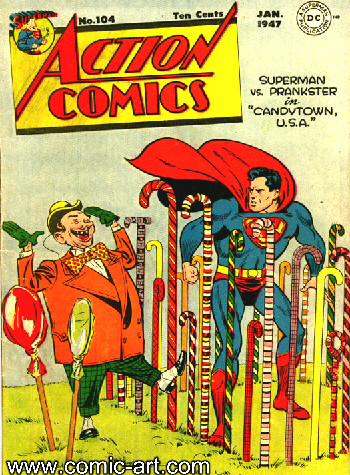 He also illustrated the sunday and daily comic strips from the middle 1940's to the 1960's - though not continually as the strip was illustrated by numerous artists chosen by DC Comics as opposed to the comic strip syndicate. Unfortunately, his tenure as the Superman artist that was admired by 2 generations of comic fans would come to an end. In 1968 with new editorship at DC Comics, several long time artists were dismissed as DC decided it was time to go for a new look at the flagship comic publisher. Wayne was let go along with George Papp (creator of Green Arrow) and Sheldon Moldoff (creator of Green Lantern and long time ghost artist on Batman). It was hard to believe that unlike Jack Kirby, Joe Kubert & other longtime artists that Wayne was not working in the comic industry and they weren't calling him.. So he went to work partime as a security guard at a Florida bank near where he lived. However forgotten he may have been by the comic companies, he was far from forgotten by comic book fans who would write him and call him & seek him out at the few appearances he made at comic book conventions. He loved talking to the fans and the fans loved talking to him, He would do comissions for fans of Superman & other DC characters and would continue to draw great Superman art until he away in 1987 of a heart attack. An excellent example of how Boring's art had developed by 1947. Wayne Boring's Superman is one of the most enduring characters in the comics hobby. Boring's stylized artwork and fine linework along with his ability to handle science fiction subject has made him one of the most popular artists of his time, and among the most remembered in comics history.